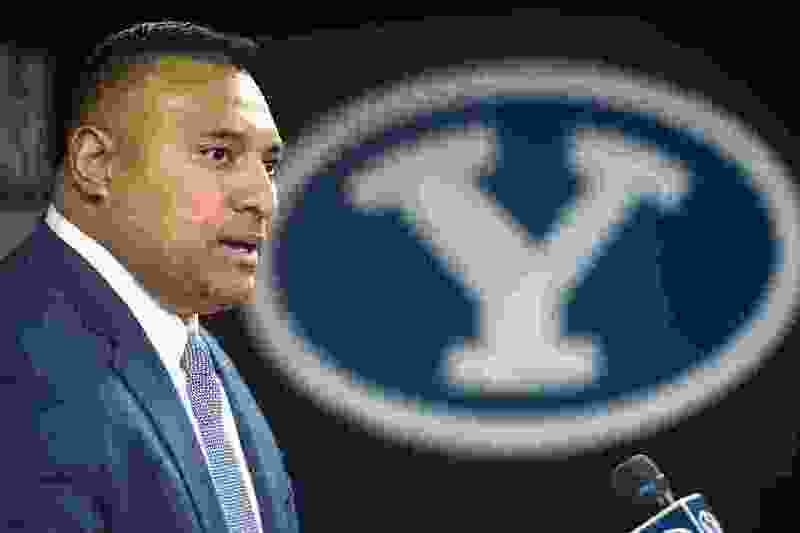 (Chris Detrick | The Salt Lake Tribune) BYU head coach Kalani Sitake speaks during a press conference at LaVell Edwards Stadium Saturday, December 16, 2017. Provo • A highly recruited prep quarterback from Arizona made Mother’s Day special for BYU’s football coaching staff on Sunday. Jacob Conover, a junior at Chandler (Ariz.) High School, announced via Twitter that he has committed to play for the Cougars. Conover, a four-star recruit, is expected to go on an LDS Church mission before enrolling at BYU. “Committing to the school of my dreams. Go Cougs,” Conover wrote. Conover also had offers from Alabama, Arizona State, Mississippi, Oregon State, Washington State, Utah State and others, according to various recruiting services. He was quarterback MVP of The Opening, a scouting event near San Francisco. Conover, 6-foot-1 and 185 pounds, led Chandler to back-to-back state championships as a sophomore and a junior, and connected often last season with receiver Baylor Romney, who signed with BYU in February. Conover threw for 3,715 yards and 32 touchdowns with five interceptions as a sophomore. As a junior, he played in five fewer games due to injury but still threw 32 touchdown passes. Recruiting websites ESPN.com, 247sports.com and Rivals.com all have Conover among the top 10 pro-style quarterbacks in the country in the class of 2019. He is ranked No. 108 on ESPN’s Top 300 prospects list for his class of rising seniors.